It's interesting to compare what author Jan Moran has to say about the semi-classic Organza by Givenchy (1996) with Luca Turin's snippet in The Guide. 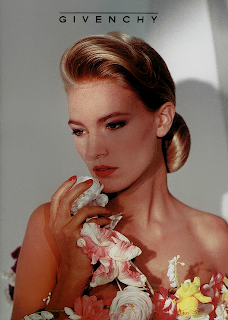 According to Moran, Organza is "A tasteful combination of fragrance and presentation, Organza oozes style". Meanwhile, Dr. Turin calls it "A fine instance of vulgarity done exactly right". My take? Both of them are right. 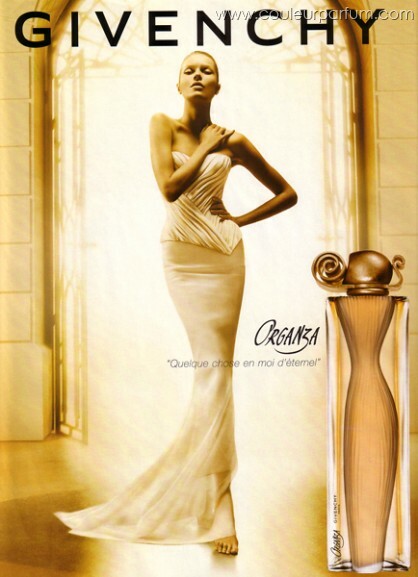 I own a small bottle of Organza extrait de parfum circa 2000. This thing is golden, and I don't just mean the bottle. Organza is a classic floriental: rich, bold, sweet, and as Luca Turin noted, irresistible even to the cranky perfume critic. It's not a Givenchy circa Audrey's era, and in fact could have just as easily be born out of the Big 1980s; but the magic of opulent white flowers with the heavy-lidded eyes of an ambery vanilla base is the stuff of a good perfume fantasy. There's nothing subtle or understated about Organza. The fragrance doesn't even try to conceal what it's all about. It starts with bold tuberose and ylang-ylang that seem to feel already hot and slightly humid, and as it sashays closer and closer there's some spice thrown in to make one undo another button to deal with how heady this perfume feels. Organza is almost cartoonishly femme, but who can resist Jessica Rabbit? Who would even want to? The whole thing gives skin a slightly honeyed quality, and as the dry-down approaches with all its vanillic goodness there's nothing one can do but let go and enjoy it to the very last whiff. Is Organza really vulgar? It depends. I don't think it smells cheap (Givenchy didn't start going there until the last decade), quite the opposite, really. Consider Organza in the same realm as a sequined and Swarovskied vintage Nolan Miller dress, exquisitely cut, perfectly fitted and showing off just the right amount of cleavage.I'd kill to a) own one, and b) have the opportunity to wear it. So in the meantime I apply a drop of Givenchy Organza parfum and go about my day. Notes (via Jan Moran): honeysuckle, peony, rosewood, tuberose, gardenia, ylang-ylang, amber, nutmeg, mace, vanilla, cedarwood. 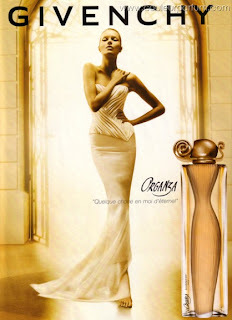 Images: ads for Organza perfume 1997-2006 (the oldest ones feature gorgeous supermodel Yasmeen Ghauri) via couleurparfum.com, detail from a 1990s Givenchy couture ad appeared in a random online auction. Great review on one of my favorite fragrances! I found an unopened/sealed jar of the body cream in this fragrance today, I knew if anyone would know about it, you would! That said, I'm pretty much in love with it.